Here’s our gallery exploring the infinity shower drain for ideas and inspiration. Let’s face it, floor drains are eyesores which we have eventually come to accept because it is a “necessary evil”. But with the progressive technology of our times, we don’t have to make do with the traditional drains, because more styles and types have been developed and are available in the market. The popularity of modern minimalist designs brought about the conception of aesthetically pleasing, customizable and functional floor drains, also known as infinity drain. Aesthetic difference aside, infinity drains doesn’t differ much functionally, but there are added advantages depending on the type/style of infinity drain you use. Solid metal – This type uses a sheet of chrome-plated or stainless steel metal sheet to cover the center portion of the drain. Grate – Metal grates for infinity drains often come in modern minimalist designs and definitely would not ruin the aesthetics of your pace. Tile Insert – The most visually-appealing, this type almost blends invisibly to your flooring, especially when you top it with tiles that matches the ones used on the flooring. So what exactly is an infinity shower drain? If you don’t look close enough, you wouldn’t even notice it’s there. Linear drains with tile inserts like the one used in this example is very inconspicuous and blends right in your floor tiles. If you want a similar camouflage effect, make sure you place it where it can run along the pattern of the floor tiles. Use the same tile pattern used on the floor for the tile inserts so that it looks continuous. Otherwise, you can also use this to place your accent tiles. This example shows a walk in shower with a stainless steel linear shower drain with solid stainless steel cover. The infinity drain was fit to the length of the shower area and was placed on the corner where the flooring and wall tiles meet, making it look like an accent frame instead of an actual drain. This example showcases a bathroom design with an infinity linear shower drain in the back of the shower creating a more contemporary look. 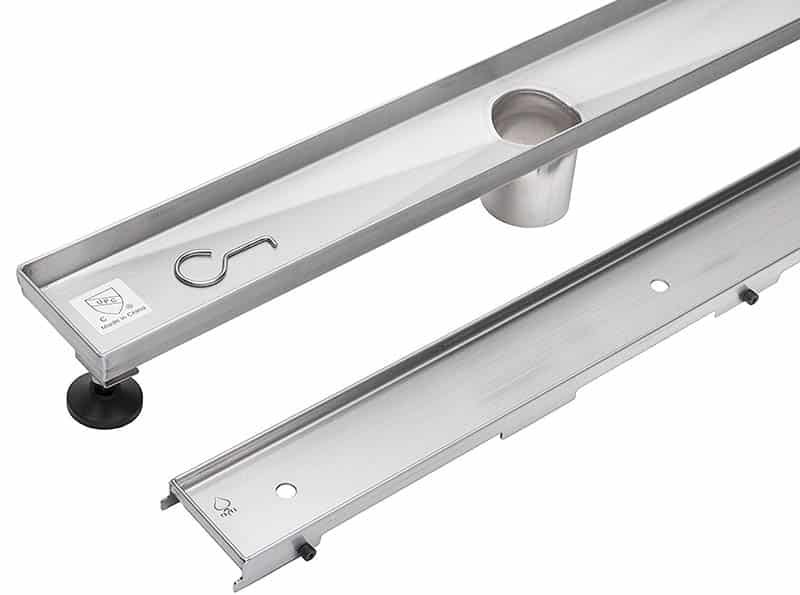 You can also use store-bought fixed-size linear drains like in this example. 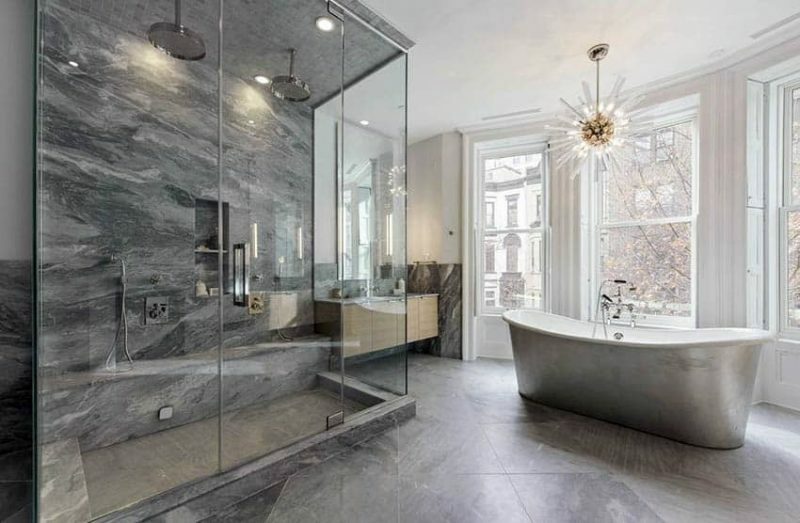 By placing it off-center and a bit away from the wall, it helps emphasize the unique irregular shape of the shower stall. You can also use infinity drains with gutter covers. They come in different patterns/designs, like this fun wavy pattern in this example, slotted pattern, ovals, circles, other geometric shapes or even a simple wedge wire gutter cover. 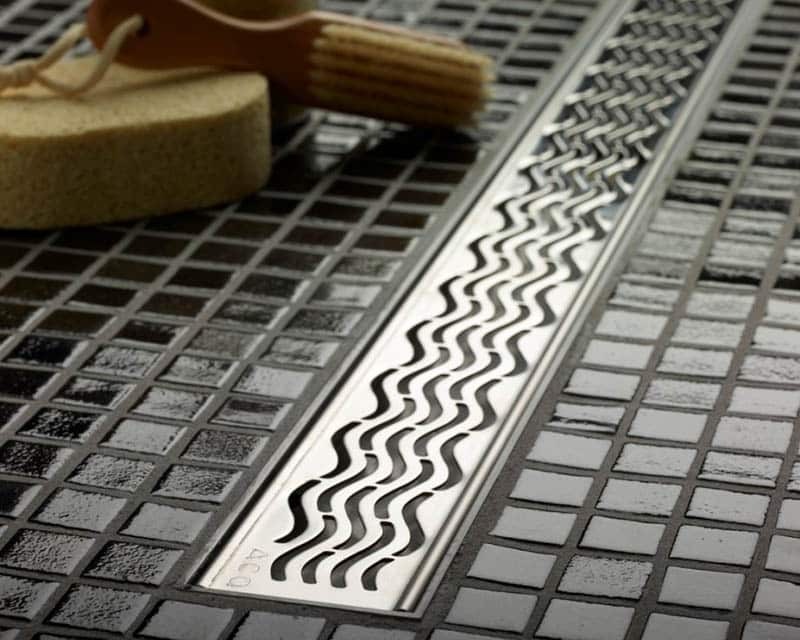 Infinity drains with tile inserts offer a cleaner & more invisible installation, as it looks far from traditional drains. You can easily hide it by placing it along the pattern of your floor tiles. 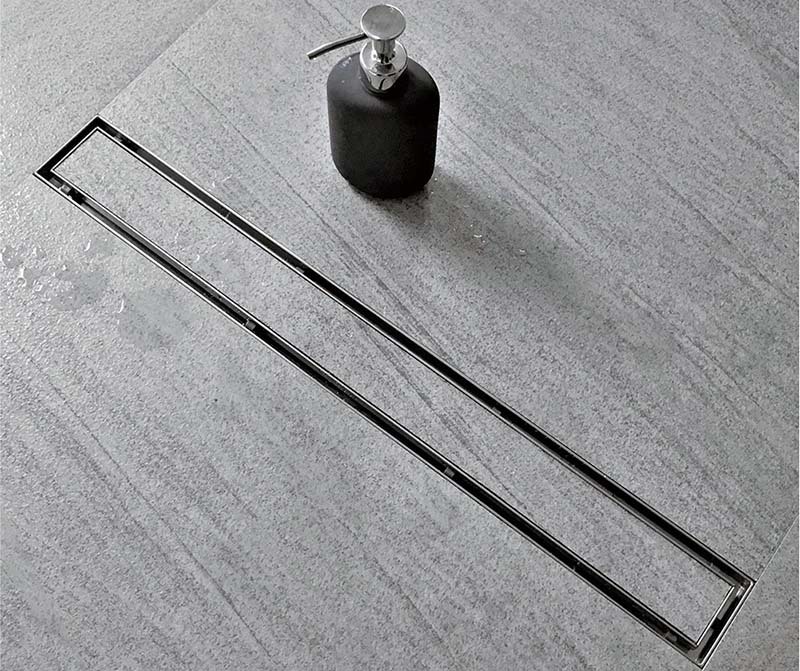 Aside from floors, linear drains can also be used on bar counters, bathroom vanities with stone counters or monolith sinks. 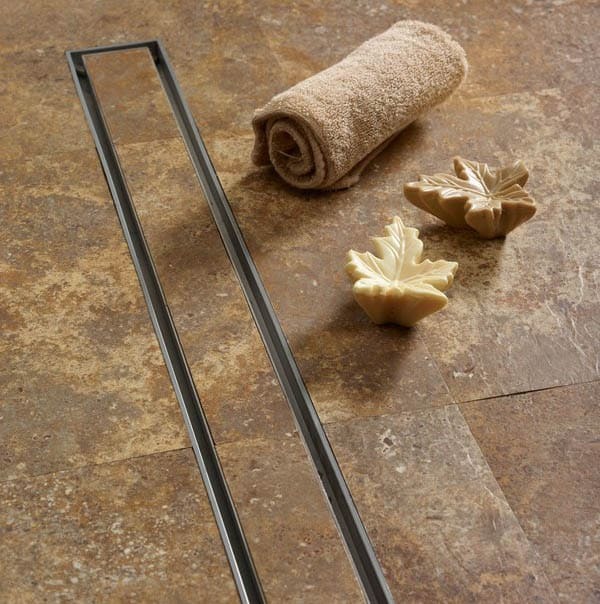 This example is a gorgeous fixed-sized linear drain with square gutter pattern. This would be great to use for commercial kitchens and bar counters to avoid drink spillage from going everywhere. Alternatively, you can also use this for your bathroom and shower. 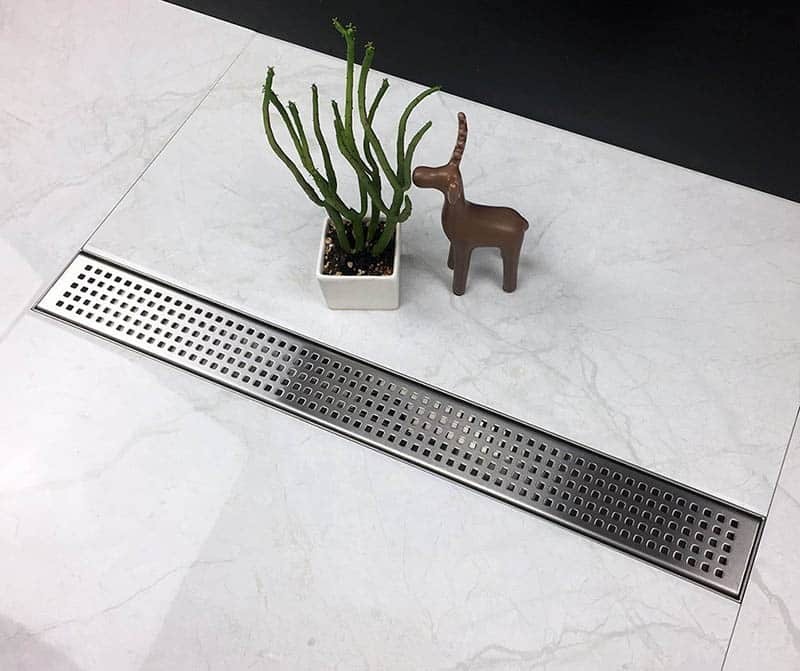 Fixed-size linear drains come in standard sizes, so you don’t have to worry about finding the right size, because they often match the standard tile sizes available on the market. Identify Location of Drain Pipes – If you are performing a bathroom remodel or renovating, using existing drain lines & designing according to their location would save you time & money, but if the existing location does not work for your plans, you might have to rework the existing drain pipes. 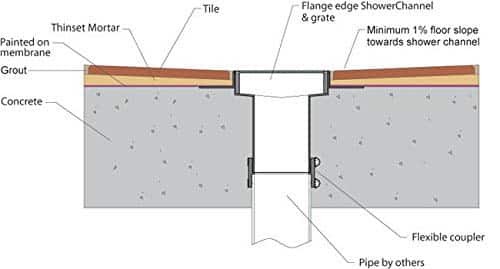 For those who are building from scratch, however, you can easily plan the waste pipe locations according to your drain layout & the flange location of your linear drain. Pre-Fit your Linear Drain – Place your linear drain on the waste pipe to ensure that your drain is in the right location. Determine Grade Height – Protect your drain with masking tapes and place the drain pan to location, making sure that it is leveled properly. Mark along the edges of the wall as a guide & use a leveler, making sure that it slopes towards the drain by at least 1/4″ or 2% per linear foot. This is to help ensure that the water flows toward the drain, avoiding any moisture/waterlog issues. 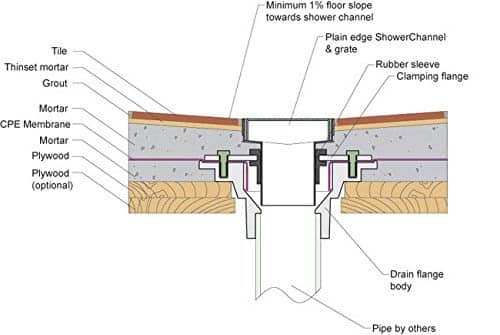 Waterproofing – using the grade lines you have marked, prepare industry-standard waterproofing accordingly, making sure to follow the grade lines to create the 1/4″ slope per linear foot. Note that depending on your country building policies and shower base material (concrete or wood), the steps for waterproofing would vary, so please make sure you are following the standard waterproofing requirement appropriate for your case. See diagrams below as reference for typical waterproofing for plywood base and concrete base showers. Install the Tiles – using standard industry practice in your country appropriate for your area of installation, install the tiles. Start from the pieces surrounding the drain pan. Once all pieces directly surrounding the linear drain is installed, temporarily install the drain grate/cover to ensure that it fits properly and can be inserted / removed freely. Once the grate / drain cover fit is perfect, install the rest of the tiles. Grouting – once the tiles have cured, you can grout and caulk your tiles using standard practices appropriate to you. 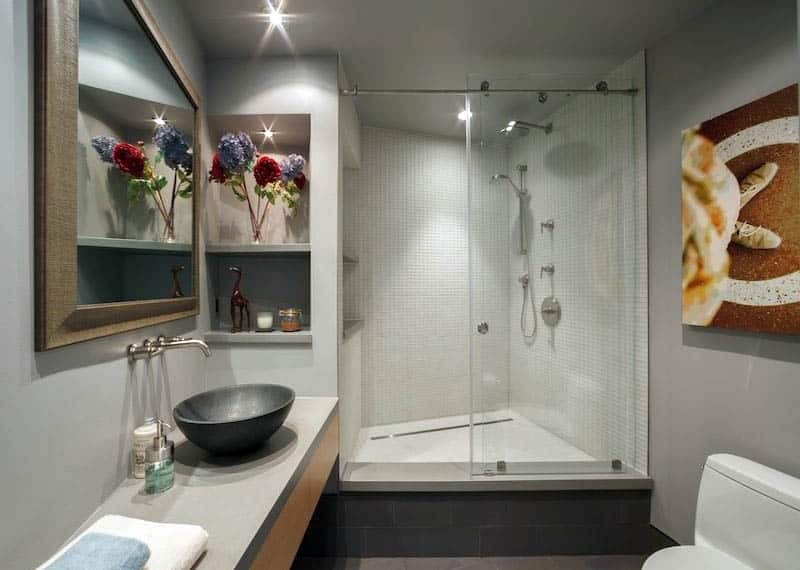 There are an assortment of bathroom remodel software that can help you with your next project. Using one of these programs you can try adding different finishes, floor plans or layout placement to get the exact design you want.